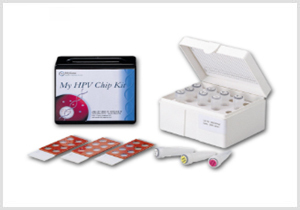 HPVDNAChip™ is a DNA Chip to detect HPV (Human Papilloma Virus) which is a major cause of cervical cancer. HPV is a ring-shaped and double helical 8kb DNA virus. It can cause cervical cancer and a number of malignancies. More than 70 types of HPV has been currently reported. HPV types are categorized according to high and low risk. High risk types (16,18,31,33,35) can be detected in cervical cancer and carcinoma in situ more than 90%. An early Diagnosis is very important for a full recovery from cervical cancer. Pap Smear and HPV test are in general use for early detection. 19 HPV type-specific oligonucleotide probe are marked on the chip slide. After PCR amplification and hybridization, each type of probe can be detected by laser scanner.